Individuals who have history thrust upon them frequently make the best movie subjects. Lawrence of Arabia, Melvin and Howard, The Last Emperor, Vera Drake, and many other cinematic profiles have done wonders with a passive character in the lead. Add Jackie to the list. 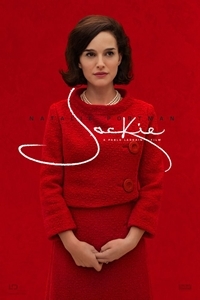 Were it not for the giant blood stain on the lower-half of her fabled pink dress — an image that director Pablo Larraín takes his sweet time revealing in a startling pullback — and her constant juxtaposition next to her husband’s casket, Jackie Kennedy could have been mistaken for a stewardess aboard Air Force One. True, she dressed like Hepburn and spoke in the same breathy whispers as Monroe, but Jackie gave out about as much warmth and emotion as a sparkling-bright, frost-free Frigidaire. Imagine a documentary portrait of the four most intensely intolerable days of your life and you’ll get an idea of the kind of emotional wallop Jackie packs. Larraín places his subject center frame — she’s present in just about every shot in the film — while his star, Natalie Portman, takes us through a cauterized grieving process unlike anything we’ve witnessed. Together they trap the character on film, like a rose frozen in a block of ice. To further blur the line between documentary and fiction: Larraín shot his fourth feature, No, entirely on three-quarter-inch video cassettes. So it’s no wonder that some of the most fascinating-to-watch moments in Jackie involve the director taking us behind-the-scenes of her tour of the White House for CBS. Larraín can’t resist intercutting fictionalized moments that took place out of public view. It goes without saying that the re-creation is flawless. Larraín cast his supporting players with an eye toward talent, not physical resemblance. The results range from the ridiculous — the superb Peter Sarsgaard would probably admit that Steve Buscemi looks more like Bobby Kennedy than he does — to the sublime: John Carroll Lynch as LBJ and a particularly weasley Max Casela as White House media liaison (and future architect of the MPAA film rating system) Jack Valenti. As Jackie’s assistant, Greta Gerwig once again finds the quiet force needed to command a scene, in this case giving her employer and friend sound advice on how to break the news to the children. And it was great to see an old favorite, the frequently ungodly John Hurt, called into service as the priest to whom Jackie first questions her faith. What does the director truly think of his subject? Was there greatness in her soul or did she simply dress well? Given the circumstances — government insiders basically call the shots when it comes to making funeral arrangements — it’s hard not to feel sympathy for the suffering FIrst Lady. But there’s a moment just before the final fade where he briefly let his guard down. How else is one supposed to read a curtain shot from the backseat point-of-view out her limo wherein Jackie spots a window dresser styling a mannequin?